I’ve never bought a new car. And I doubt I ever will. Did you know that a new car depreciates several thousand dollars the moment you drive it off the dealer’s lot? I don’t know about you, but I think that stinks. It really turns me off from buying a new car. It’s easier to buy new. You choose exactly what you want and you know no one else has ever used that car. But, for a little time and effort, you can find a used car at a much lower price and use the money you saved towards something else worthwhile. Do you see that big smile on my face as I stand next to my new used Subaru affectionately dubbed The Red Pony? I am smiling because the last time I had a car exclusively for my own needs was during college. That’s right. College. For the past 18 years, I have used my feet and the METRO bus as my primary modes of transportation. After years of enviro-commuting, I realized I needed more flexibility. I wanted to buy a car this summer. Here’s what I learned about BUYING A USED CAR from a private seller (not a dealership). 1) Figure out what kind of car you want. For dependability and longevity, I wanted a Toyota, Honda or Subaru. For hauling stuff, I wanted a wagon. 2) Figure out how much you want to spend. I wanted to spend $3000 or less. Pick a price that’s reasonable to you and your budget. I was totally willing to buy an older car in order to stay within my price range. To find out how much used cars are worth, I recommend looking them up at Edmunds.com and Kelley Blue Book. Both have very helpful info. 3) Withdraw the amount you want to spend in cash and keep it somewhere safe. 4) Email your friends and family and let them know you’re looking for a car, what kind you want, and how much you want to spend. Great deals can often be found through your contacts. 5) Check your local Craigslist for car postings every day. Look under “For Sale” and click on “Cars & Trucks.” Do a search for the make and model you’re looking for. 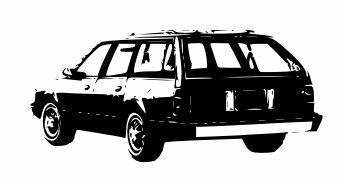 For example, I’d do a search for “Toyota wagon,” and then another search for “Subaru wagon” and another for “Honda wagon.” It helps to check the posts several times a day. 6) Look for postings that give a detailed description of the car with plenty of good photos of the car. Don’t trust the ones that give hardly any description and take one or two fuzzy photos of the car with their cell phone. Forget ’em. 7) Enter the car’s license plate on CARFAX to find out the car’s VIN. Then enter the VIN on this VIN Check site to find out if the car has been stolen or has been reported as a salvage vehicle (as in it was in a major accident). If it’s been stolen or salvaged, let it go. By the way, both of these services are FREE. 8) Do a search on Google with the seller’s phone number. Some sellers only give an email, but if they do list a phone number, type it into Google and hit return. If the phone number is listed as selling many other cars, I let them go. They are what I call Car Flippers. They are either mechanics or people buying cheap cars at auction which they turn around and sell for a lot more than they bought it for. In most cases, the car is not their daily driver and they probably know hardly anything about the car. 9) If the seller seems legit, contact them ASAP. The early bird definitely gets the worm. Let them know when you’re available to see the car. Ask them if you can take it for a test drive. Ask them any other relevant questions. For me, I needed to know if the air conditioner worked well. This was a deal breaker for me. 10) When you visit the car, bring someone you trust with you. It helps if they know something about cars too. This person will help you to make a rational, logical decision about whether you should buy the car. I brought Marcus, who doesn’t know a ton about cars, but knows enough. He’s also very rational. We split the cash between us so that if one of us was mugged, we wouldn’t lose it all. 11) Take the car for a test drive. Check all the elements to make sure they work (ie. A/C, heater, windows, window wipers, going in reverse, etc.). Look under the hood. Ask to see the car’s repair records and receipts. Do not make a decision until you are satisfied with what you are buying. If you aren’t satisfied, be willing to walk away. NOTE about inspections: Some recommend taking the car to a mechanic for an inspection. I don’t know many sellers who are willing to do this. Also, I don’t trust any mechanics except my own. Getting in to see them would take longer than a day and the seller isn’t going to be willing to let their car go for that long. If you know a mechanic nearby and the seller is willing, then do it. NOTE about negotiating price: Read this article and this article to learn more. It took us about 8 weeks to find the right used car. Patience does pay off. 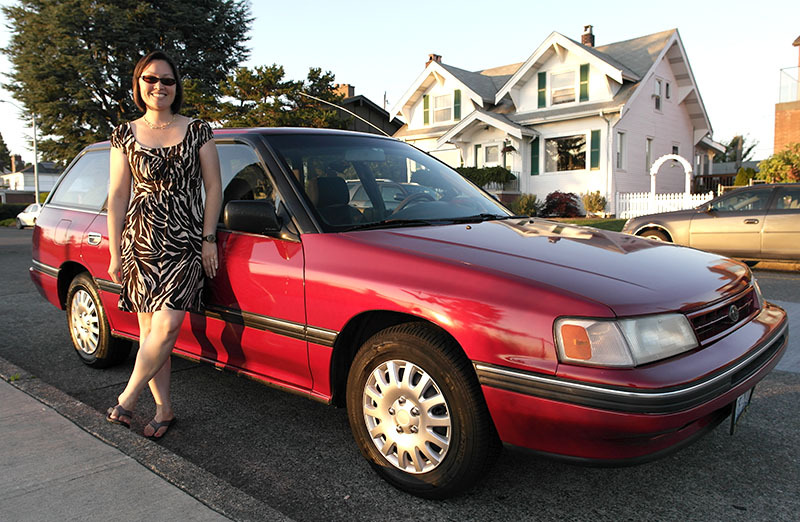 We ended up buying a 1990 Subaru Legacy Wagon from a very nice family in Mill Creek whose Grandma Linda had driven it and taken good care of it for years. They had all the repair records and receipts. The car had recently received a new paint job and new tires. She drove beautifully and her A/C blew fast and cold. They listed it for $2000 and that’s what we paid them. It was a fair price so we saw no need to negotiate. I couldn’t be happier with my Red Pony. Take the time and effort to do your research and you too can find the used car of your dreams. ps. This post is dedicated to a kid named Gooey who I hope will remember the good times we had driving around in the Red Pony with the radio blasting and the wind whipping through our hair. Photo by Marcus Donner. This entry was posted in Transportation by Peg. Bookmark the permalink. Thanks, Noell. I completely agree with Rachel Meeks. Trying a “no spend” month is a great way to get assess your spending habits, find new ways to save money, and find creative ways to use and appreciate what you already have. And like Ms. Meeks wrote, you will suddenly end up with more free time on your hands. It’s like what I wrote about in my post “The Best Things in Life are Free Challenge,” if you consciously choose to NOT spend on anything that isn’t a necessity for ONE MONTH, you will be amazed at how many benefits you will reap. And you might just want to keep it going after a month has gone by.